The crickets in my head chirp loudly today as if I can hear them through the snow. Late November days can be harsh in Northern Michigan, and the crickets have not been around for months. Still, I can hear them. Bird sounds offer a respite from the unrelenting crickets desperate to be heard in my head. During the daytime, ducks take charge of the lake. Common loons serenade from a distance as they search deep water for perch or bass. Mallards, mergansers, and buffleheads paddle nearby on the water, content as they dip their heads while searching for minnows. Mallards shuttle between the shoreline and the lawn beneath our bird feeders, their path clearly seen through the snow. By late afternoon, chickadees sing as they help themselves to seeds from the feeders, while a pair of mallards watches from below, the male craning his head upward as if willing a chickadee to drop a seed just for him. If I venture outside, the male quacks loudly at me, scolding me for intruding upon his territory, and waddles off towards the water’s edge. I don’t remember exactly when the crickets appeared. Was it during the summer of 2011 when I began suffering from excruciating headaches? Was it after I found out I had a brain tumor? Or did the crickets begin to chirp as edema began surrounding the tumor, its edges slightly altered after the radiation began to work its way in? 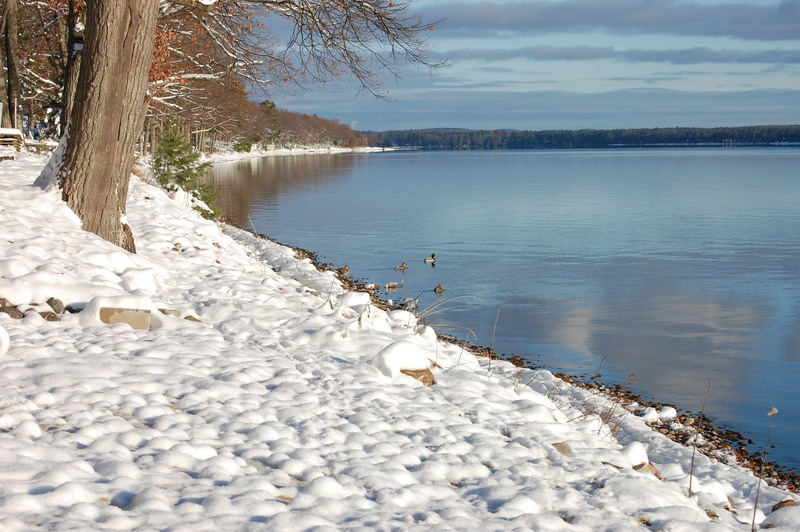 One morning I walked through the snow towards the lake, and shot pictures of ducks as they swam away from me. I wished that I could swim away from this constant noise in my head, and the balance issues that prevent me from running now or walking a straight line in the hallways of my house. I know this edema will pass eventually, and the crickets will disappear. I imagine myself next summer swimming stealthily out towards deep water and diving down, searching for treasures only water can disguise. When I return to shore and step lightly onto the hot sand, I will feel a warm summer breeze stretching across my body as it silences the crickets. I will look upwards towards the brilliant sky, thankful and smiling.